Use your pressure cooker to make this cheesy vegan dip with cauliflower, carrots, and cashews. We added nutritional yeast and spices to give it that authentic Mexican queso flavor. We especially love to stir some exciting extras such as chopped tomatoes, bell peppers, jalapeños, and cilantro into the dip. Serve with store bought tortilla chips or homemade baked pita chips. It is incredible how easy it is to create a vegan appetizer in just about 20 minutes! Place cauliflower, water, carrots, and cashews into the pot of a pressure cooker. Seal lid on pressure cooker, select Pressure Cook, and cook on High Pressure for 5 minutes. Relieve pressure through the quick-release valve. Drain water from the pot; add reserved liquid from the diced tomatoes, nutritional yeast, sea salt, chili powder, cumin, and garlic powder. Blend mixture with an immersion blender until smooth; transfer to a mixing bowl. Stir tomatoes with green chilies through the dip; add any optional additions you have chosen. Rumor has it Tom Brady follows a vegan diet. If it's good enough for him, then why not serve this queso on Game Day! Per Serving: 100 calories; 5g fat; 11.1g carbohydrates; 7g protein; 0mg cholesterol; 333mg sodium. 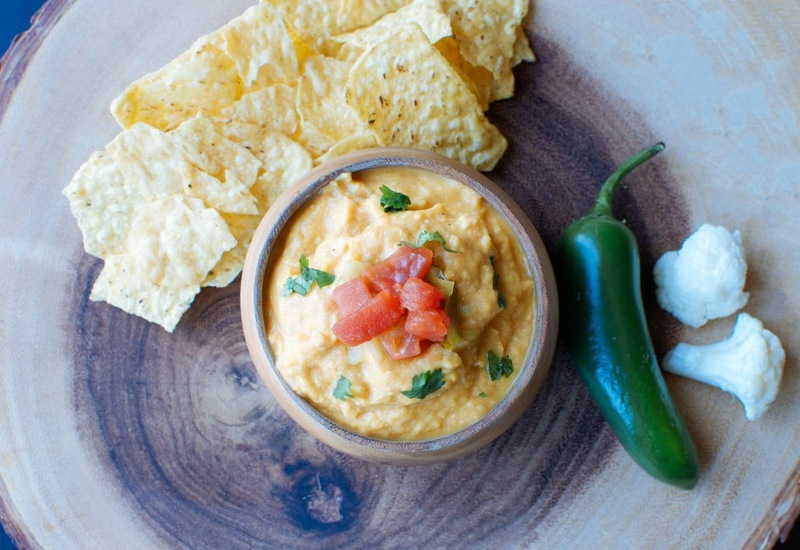 This vegan queso dip is truly amazing, especially with the added diced chilies. I definitely prefer to eat it warm, but it goes perfect with my tortilla chips. Probably going to make this again for the Super Bowl party! This turned out so yummy! I love that I didn't have to soak the cashews over night, that can be such a pain! We added diced chilies and jalapeño for spiciness and loved it. After preparing, we put it back in the pressure cooker and left it on the Warm setting, it was perfect! Wasn’t a huge fan of the texture but the flavor wasn’t bad for homemade vegan cheese. I added some extra salt for flavor but other than that this recipe was pretty good. I had some friends over, one of them is vegan, and she appreciated the fact that I made this. My immersion blender didn’t get it as smooth as I like? So instead i moved it to a blender and blended it until smooth. I also added some spicy Mexican sauce for flavor. It’s great with chips. Once I added cilantro, jalapeno, and bell peppers, that made a huge difference in the overall taste of this dip. On its own I probably wouldn't really enjoy it. I'm not a huge fan of nutritional yeast, I'm convinced there has to be a better alternative out there, I just need to find it.